SmartJars® will bring order to your cluttered work area. 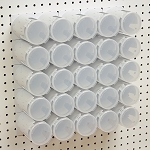 Easy to use and modular: Perfect for organizing craft supplies, beads, nuts, bolts, herbs, spices...you name it. Know where to find the supplies you need and where they go when you’re done. 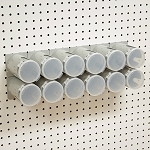 Docks lock on to pegboard and can be rearranged, jars nest securely in the docks. 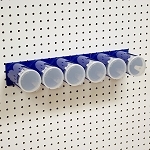 "By far the best organizing tool in my shop. Nuts, Bolts, Screws... so easy to grab the jar or jars needed and go get the job done!" "We got a set on their KickStarter campaign and have been using them for a year as a wall of spice jars. I love them!" 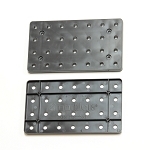 Black Plastic Pegboard 16 in. x 16 in.